[SatNews] British-based global designer and manufacturer of RF distribution equipment, ETL Systems, is building on its existing portfolio of superior quality RF systems and expanding its product range to address fibre applications. A growing number of global projects require such a solution and ETL is adding to its range of products which provide the highest level of redundancy whilst maintaining and improving quality of signals despite a rapid increase in traffic density. Also at SATELLITE, ETL’s 128x128 compact Vulcan matrix, an extremely compact matrix with impressive RF performance, will be on display. The compact configuration offers a cost effective solution for larger RF routing systems. It is typically used for distribution of multiple L-band signals in a broadcast environment, through large satellite teleports with a high volume of satcom traffic. It is housed in a 16U 19” rack enclosure and has extensive on-board monitoring and reporting of RF card amplifier status, CPU and PSU status and HMI communications. New: ETL Systems’ Fiber Solution—Building on existing RF expertise, the new range will have superior RF specs and provide a unique design for high isolation applications. Full details of the new range are to be launched at SATELLITE. New: ETL Systems’ Dextra Splitters and Combiners—A new range of web-enabled professional splitters and combiners to cover the L-band frequency range will be available to view at SATELLITE for the first time. The new Dextra series includes 4-way and 8-way splitters and combiners in both single and dual configurations and 16-way splitters and combiners, available as single units. The range offers consistently excellent RF performance, including high linearity and low noise figure, and outperforms some of the more expensive models available. 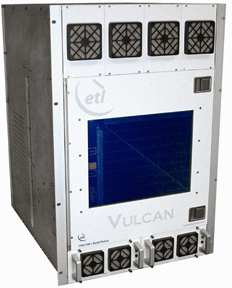 ETL Systems’ 128x128 Vulcan Matrix—The 128x128 Vulcan Matrix (Model VCN-10) is part of ETL’s “V series” matrix family. It is an extremely compact matrix which can be used for many high resilience high performance applications. Other matrices in the V family which will be on display include the 64 x 64 Vortex Matrix, the 32 x 32 Enigma matrix, the 16 x 32 Valiant Matrix and the 16x16 Victor Matrix. The Vulcan’s compact configuration offers a cost effective solution for larger RF routing systems. It is housed in a 16U 19” rack enclosure and has extensive on-board monitoring and reporting of RF card amplifier status, CPU and PSU status and HMI communications. CABSAT will be the first opportunity to see the 128x128 Vulcan model in the Middle East. ETL Systems’ Alto Amplifier—ETL’s Alto series range of L-band Amplifiers will also be on display. The Alto family includes 4, 8 and 16 module options with variable gain and can be remotely controlled via Ethernet and web browser interface. The design of the amplifier is modular, allowing hot-swap of amplifiers and power supplies, and can be controlled locally and monitored via the front panel display with simplified push buttons. It is designed for the front end RF chain and provides amplification and slope compensation from cable loss for teleports and TVRO and head-ends.